Like most new Moms, Maureen Howard was wishing for a magic wand, something she could simply wave over her young son Will’s head, that would help him sleep for longer than thirty minutes. The situation would have been frustrating for any parent, but for Maureen, who is a pediatric physical therapist, it became a puzzle she desperately wanted to figure out. She wanted to know what it was about that stroller that helped her little boy sleep. What she couldn’t have known was that the solution she was searching for would have an impact far beyond her own family. So Maureen sat down at her sewing machine and decided to create a sleepsuit -- something that would create that same feeling of security when Will was napping in his crib. The innovative Mom began by modifying an outfit she’d seen Will sleep in snuggly before. She removed the hood and changed the neckline, so there wouldn’t be any fabric around her son’s face and then adjusted the arms and legs, so his hands and feet would be free but the rest of his body would be contained. But the real magic began twenty months later, when the couple’s second child, Tori, was born. When it was time to take her out of her swaddle, Maureen pulled the sleepsuit out of storage, to see if its miraculous powers would have the same impact. But it’s one thing to sew up a sleepsuit for a few friends and an entirely different situation when it comes to bringing them to market. Aside from finding a professional seamstress to help with a prototype, the couple had to be sure the sleepsuit conformed to the Consumer Products Safety Act. Two years later, the couple expanded their test market once again, when Maureen gave birth to their third child Ryan. By that point, they were standing by with cameras to show the remarkable difference Maureen’s invention could make. And they were also confident enough to go into production, without even one sale. Word spread like wildfire, through Mom’s groups and on Mommy blogs. It wasn’t long before Maureen was invited to take part in a celebrity gifting suite, and her magic began taking hold in Southern California. It wouldn’t be long before sleep experts began suggesting the Magic Sleepsuit to clients. And as Moms called local stores, the stores started calling Maureen. One of those calls came from a small chain called Isis that offered parenting classes. And as luck would have it, the owners of Isis got a call themselves. Babies R Us wanted them to begin offering their classes at select stores and the instructors brought Maureen’s invention with them. This year alone, the couple is expecting half a million dollars in sales. And next year, they’re projecting over a million. And as their company grows, so does their family. Their fourth child, Grace has become the Magic Sleepsuit model. “I love the idea that something I did is making a difference in so many lives,” Maureen said softly. “I loved doing that as a pediatric physical therapist and now I can do it in a much bigger way. 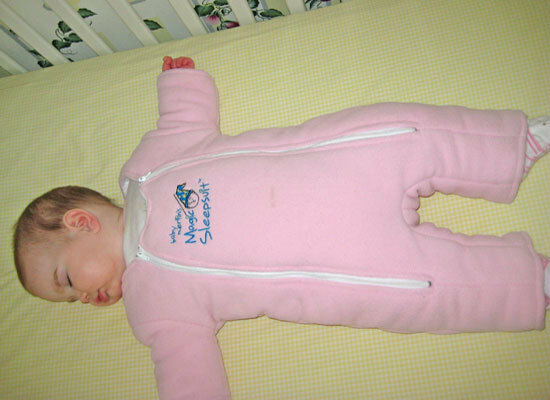 Maureen's youngest daughter, Grace, was the last of her children to pose as a Magic Sleepsuit model.